Since the Second World War, the Japan China relationship has always been awkard and uneasy and they have never been close. This is true not just from the government and political level, but among the ordinary citizens as well. I am a Chinese. My grandfather would never buy any Japanese goods when he was alive. When I searched “Japan earthquake” 曰本大地震 on Google.com in Chinese today, a lot of the results returned with forum posts with revengeful messages like celebrate Japan earthquake. A lot of the Chinese people still cannot forget and forgive the crime done by the Japanese in China during the Second World War. In one city (Nanjiang) alone, more than 300,000 people were killed, many of them women and children. Even nowadays, many Japanese are still freighted to travel to Nanjiang for holidays, fearing of revenge. Years ago, there were a Japanese couple travelled to Nanjiang specially to apologise. Everyone is equal in front of natural disaster. Amid natural adversity, we should put aside cultural differences, nationalism, politics and even history. Just think of everyone as a human being. 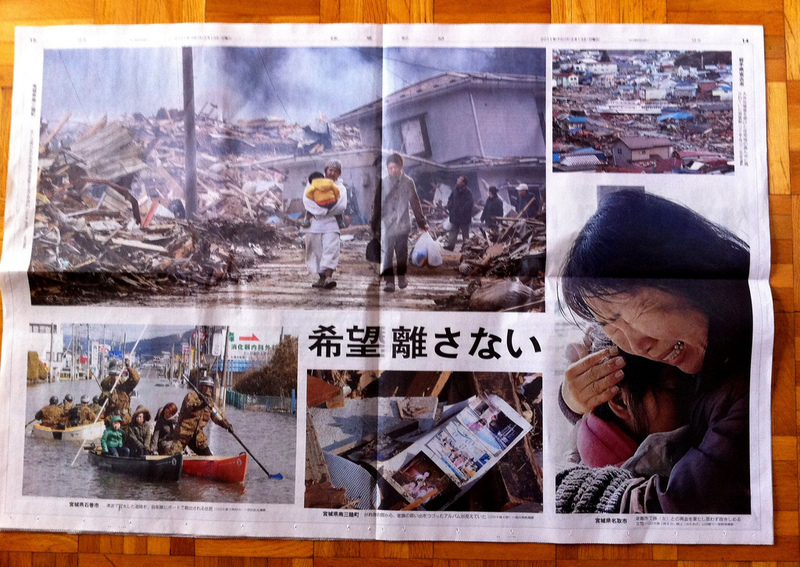 Let’s care for Japan earthquake and tsunami disaster victims. Offer whatever you can offer to help: money, prayers, communication, blogs. May be in doing so, we discover some common traits in all human beings, above race and nations. Although the recent disastrous earthquake and tsunami have caused a lot of sufferings to Japan, the Japanese people still maintain unity and uphold the discipline and respect for the values ​​of mutual assistance. There are long queues in the Tokyo subway stations and convenience stores. Every person is just waiting very quietly, no jumping, no looting, no cursing. School hall is a safe haven for the victims, unlike the schools in Sichuan when earthquake stoke China. The Chinese Internet users see the the stark differences between the Sichuan earthquake 3 years ago and the quake in Japan and give thumbs-up to the Japanese. After the earthquake, there are long queues everywhere. The railway is suspended and a large number of people cannot go home. At stations in Tokyo, hundreds of people are quietly waiting to buy tickets. You don’t hear angry complains. In Japan’s Haneda airport, the situation is the same, long queues, but quiet and orderly. Dozens of people line up on both sides of the stairs and left in the middle a smooth path for people to move. Restaurants offer free curry rice. A number of schools along the Tokyo stations open up to office workers who are stuck and cannot go home. Inside them, there are sufficient food and blankets enough for thousands laid out in order. Many hotels change their sign from a price to “sanctuary” for free accommodation. Sendai survivors who are restaurant chefs cook free curry rice. Electrical shops offer free mobile phone charge. It only takes one click of a button to get drinks from the slot machine. Public telephones are free to dial. Japanese Internet users leave messages after the earthquake: “We must assist the evacuation of foreigners who do not speak Japanese, even if you only say Hello or OK.” The internet users also remind each other: “to care for the elderly women in particular. Is your neighbour living alone? Remember to knock on the door.” “Please tell your friends who cannot go home that they can stay in the following places for free” There were reports of looting and shops increasing their prices after the quake in Christchurch, New Zealand. Tokyo is an equally developed city. But there’s no such thing in Tokyo. The Chinese media continued to say that the Japanese shared a common value which is “taking the big picture into consideration”. This helped them overcome adversity with dignity and compose. Hi, I am a chinese and my dad and mum hates the japanese. My dad was really happy (which made me kinda want to kick him up the back side) about the earthquake. I was fairly sad about it actually. What do you think?? Do you think that the japanese should suffer just as the chinese suffered many years ago?? Also, I have a weird question, if I were to fall in love for a japanese girl would I be a disgrace to the chinese? I have been wondering about this for a long long time now. Many Thanks. Japan had been attacked and decimated by earthquake hundreds of times through history, and their government is too slow to react as it always is. That’s why Japs remain calm, since they cannot rely on an incompetent official. I once expect JSDF can be highly-educated and efficient military units, but judging their performance after earthquake, I can say it will be a miracle for those folks to defend their “beloved fatherland”. Most of the tsunami-defense dams and walls installed alongside Japanese coastline are designed for 6 meter tidal waves, but this time the wave is 10 meters high. I did the search in google using “曰本大地震”, and I do not see any of the message that you mentioned. Hi, thanks for your comment. The article was written almost one year ago. At that time, I did find many messages. I am not surprised that the subject may have subsided.